Virtue and its opposite, vice, seem to have gone the way of high-button shoes. Neither are spoken of much anymore, whether positively or negatively. Peter tells us that we are to add virtue to our faith, because that is what God has called us to (2 Pet. 1:3, 5). How can I add it to my faith unless I know what it is? Whereas many things can be defined by their opposite, such is not the case with virtue. It cannot be defined by knowing what vice is. Many police dramas include a division known as the "vice squad." This group of cops go after so-called 'moral crimes,' such as gambling, prostitution, illegal alcohol, etc. NOT gambling does not mean one is virtuous. NOT involving oneself with prostitution does not make one virtuous. NOT selling alcohol illegally does not make one virtuous. One may not do any of the above-mentioned things and still be a complete scoundrel. Virtue, by definition, means "moral excellence; goodness; righteousness." In the two verses under consideration, 'virtue' translates the Greek word ἀρετῇ (arete) [Strong's G703], and basically refers to the concept of moral excellence. Or, maybe you have heard the phrase "morality is relative." This is simply a case of "every man doing that which is right in his own eyes" (Deut. 12:8). 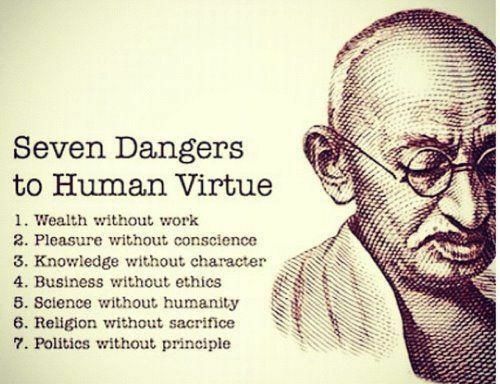 Therefore, by definition, virtue and moral relativism are mutually exclusive. We are to not be like the world (Rom. 12:2). Because we are told to add virtue to our faith, it is evident, then, that virtue is not something with which humans are naturally gifted. And, because this directive is aimed at followers of the Lord Jesus, it is also evident that virtue is not something that is a result of our new life in Christ. Adding moral excellence to our life is not an easy task. We cannot simply pray about it and ask the Lord to give us virtue, and expect the job to be done. We must put our effort into this process--and it IS a process that will take much time. Until then, meditate on Eph. 4:22-24 for a few days. Please consider leaving your response below--either through words, or simply checking the appropriate box that equals your reaction.